Rome’s musical output has been incredibly prolific over the last decade and a half of the project’s existence. 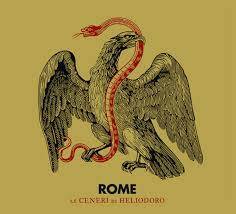 Releasing albums at the rate of practically one every year, Rome has much to say and the band is Jerome Reuter’s way of expressing many emotions and opinions on revolution, love and the way forward, all within the neofolk genre in one way or another. Le Ceneri Di Heliodoro is extremely timely as the lyrical content is pointedly speaking of the dissolution of unions and in particular that of Europe as a powerful entity facing ruin. Whatever your opinions of the current political climate on the mainland and beyond is not something that Rome is concerned with – this is one person’s thoughts and feelings on something that has happened countless times in human history; powerful nations rise and fall over and over and humanity learns nothing from its mistakes. Ultimately, this is what Le Ceneri Di Heliodoro is dealing with at its core. Revolution songs are not a new thing for Rome and previously Reuter has dealt with French rebellion, Spanish uprising and the fight for Rhodesia but here we hear him speak more broadly of our place in the modern world. ‘Who Only Europe Know’ has Reuter plainly state his case for the Europe of old and the distaste felt for the United States during ‘The West Knows Best’ is tangible in its barbed lyrics. Musically the songs are simple in structure with Reuter’s voice taking its place at the forefront, his rich baritone giving heart and weight to each word while the subtle strings of ‘Feindberührung’ weave themselves around the gentle acoustic guitars and ‘Fliegen Wie Vögel’ incorporates brass into a song that reaches for the heavens for some respite. ‘One Lions Roar’ is not subtle in its metaphor for the displacement of people and ‘Black Crane’ is similarly obvious in its subject matter yet Rome is deft at not making it seem trivial or ridiculous, instead you’re led into thinking more deeply about the matters that mean something to its creator and for many other people standing at the precipice of the unknown. Of course, musically Le Ceneri Di Heliodoro is beautiful at all times; Reuter’s voice is sublime, conveying feeling with each note sung and the simplicity of the guitars is a welcome touch – there’s no need to go overboard here when the subject is already heavy enough. There’s tinges of sadness within ‘Uropia O Morte’ and the track moves on melancholy rhythms that lead into the closing moments of ‘Desinvolture’ where the sense of unrest is somewhat alleviated although it is never far from the thoughts of the narrator or the listener. Le Ceneri Di Heliodoro speaks of ruin and tries to teach us that the modern world is a product of our own doing and that as a collective we must do more to change it for the better. Posted Feb. 4, 2019, 7:41 p.m.